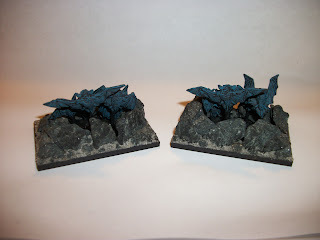 If there's one set of miniatures wargame rules I love for their flexibility it has to be Hordes of the Things. 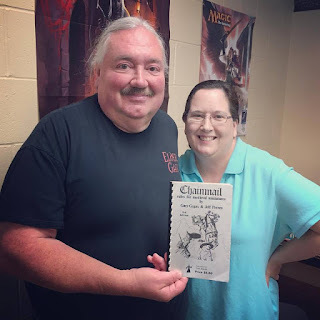 Wargames Research Group simplified and enhanced their De Bellis Antiquitatis rules for Ancient (and Medieval) wargaming rules so that they might be used for fantasy gaming. The ability to use any and all minis to build an army that can do battle with even vastly different armies makes this ruleset one of my favorites. I'm nearing the completion on the construction of a Dwarf army for a current local campaign. I shoulda, woulda, coulda (No Excuses!) had it completed but for some pressing thesis work. 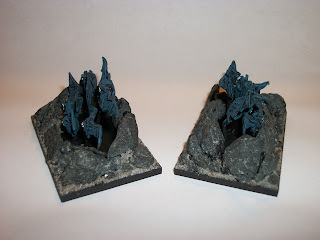 I'll try to get some good pictures of the elements of this army and show them off, highlighting the variety. Among the elements in the ranks are Axe Wielders (Blades), Crossbows (Shooters), Boar Riders (Knights or Riders), a Frost Giant (Hero) and a Pony-Mounted Dwarf (Hero), Bears and Handlers (Beasts), a Dwarf Spellcaster (Cleric), Bat Swarms (Flyers), Two Dwarves among Cargo (Lurker), a Giant Cyclops (Behemoth), a Gargantuan Dwarf on Clouds (God), and a Gold Dragon (Dragon),. Part of the fun in the construction of such an army is the creativity that goes into making the bases new and interesting. Sometimes just arranging the individual figures on the prescribed base sizes can be a challenge but it goes beyond that when a figure or figures come with attached bases that would make the base terrain appear odd or lumpy, or when the attached bases are bigger than the prescribed base size, or when the figure simply doesn't fill out enough of the base to make it appealing. The camps and strongholds can get particularly fun to construct. 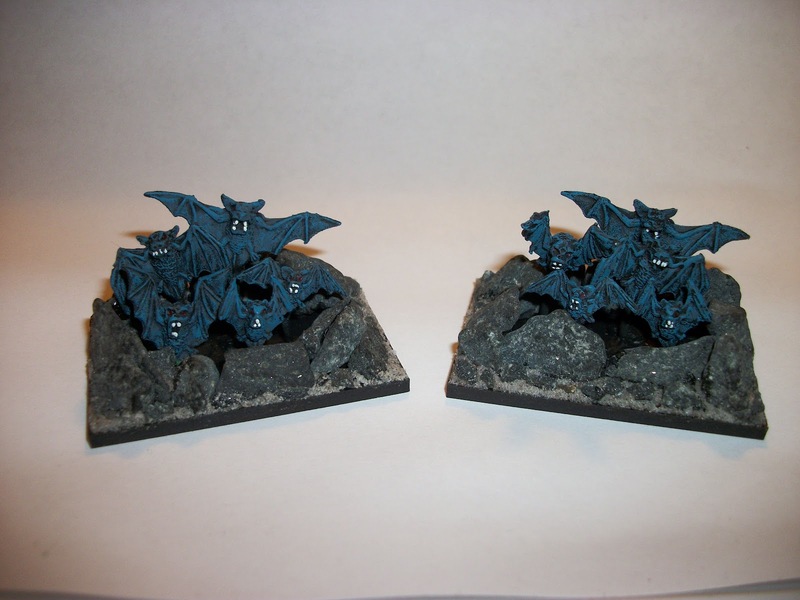 For a first look, here are some simple Bat Swarms from Games Workshop painted to fit the blue color theme much of my army sports, arranged in rock formations to appear as if they are emerging from a cave mouth. 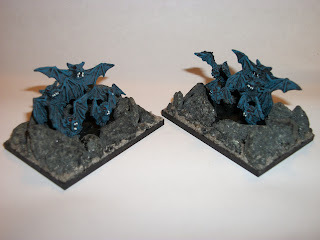 I used Vallejo Paints and Reaper paints, some rocks from a craft store like Michaels, along with some Grey Pumice also from Acrylicos Vallejo, and they are mounted on George Bases from RGD Products (sold locally at Games Plus and at some conventions) in 60mm x 40mm size (standard Flyer base for 25mm to 28mm figure scale). 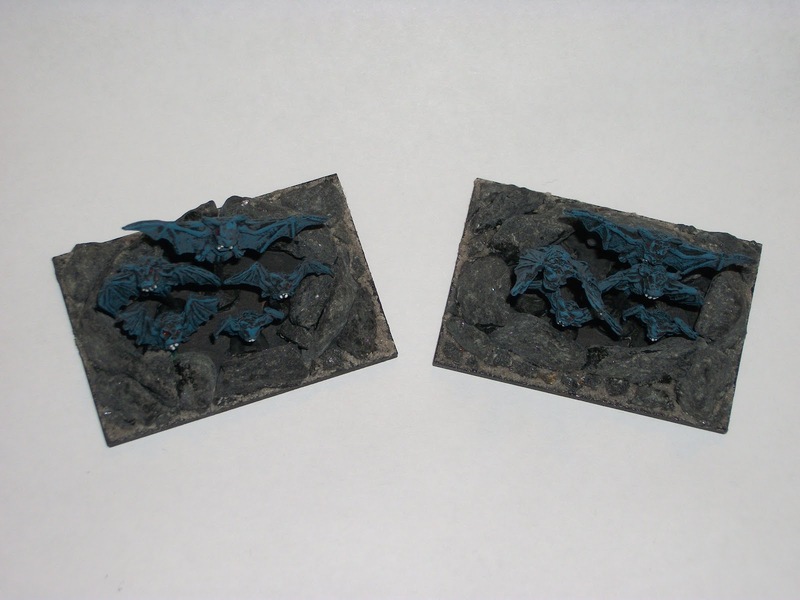 If you aren't local, I would suggest checking out the GF9 Econo Bases from Gale Force Nine which can be had in quantity for low cost. I have yet to seal these elements (I'm a fan of a Matte Finish) because I might still hit the bats with a bit of wash, though I don't want them to be much darker. The finish might do enough along those lines. Plus, I want to go over the red eyes a time or two more, perhaps even switching to orange from red, since that might obviously contrast a bit better with the blue tones. We'll see!